Welcome to our summer concert series! 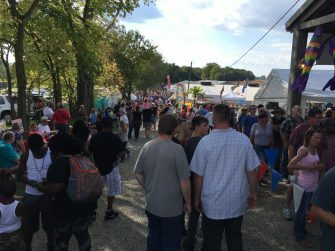 In addition to our well-known annual Ohio Fish and Shrimp Festival, we are adding four smaller events, giving us one weekend-event per month beginning in June and concluding in October. 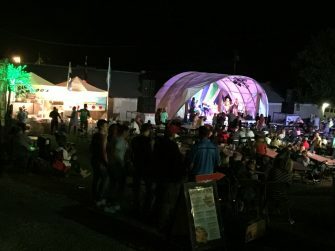 These smaller events will be held on Fridays & Saturdays, feature live music, family activities, an outdoor bar and dining, and will be open from 6-9pm both evenings. Excluding the Ohio Fish and Shrimp Festival and the Halloween Bash, General Admission is $5; Free for children 12 & under. A father and son duo from Dayton, Ohio. The Storm at sea is raging, so prepare for Troubled Waters!! Troubled Waters is a Blues/Jazz/Funk band assembled in Dayton Ohio. They have been preforming together for approximately a year, gracing many venues with their good vibrations. Despite their short time together they have worked to be a force to be reckoned with. Jack Waters, Born under a harvest moon on Oct 14, 1957, son of an Air Force General and a pianist, began taking music lessons in elementary school at an early age. As time went on he worked hard to become the “Blues Man” he is today. 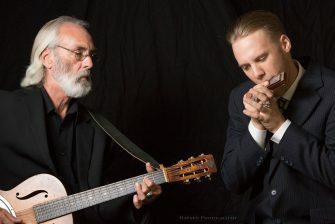 Starting with the Piney Brown and the Swift Wind Band gave Jack the opportunity to grow with seasoned blues men from the start of the Blues movement. Inspirations for Jack were legends such as BB King and David “Honey Brown” Edwards, with whom he has had the honor of playing with. Life changing experiences and years have added a kind of “musical wisdom” to his play style making him a player quite easy on the ears. Wife Tina, and sons Joe and Noah Waters and daughter Krissy Waters, have been a great support through his journey. Joe Waters son of Jack Waters inherited Jacks natural ability for the Musical Arts and began his musical career at a surprisingly young age. At age 6 Joe and family took a fated trip to dinner to the Cracker Barrel. Like any good six year old, Joe could not resist the urge to run into the gift shop and pick up the first toy that caught his eye. This “toy” turned out to be a harmonica that would change his reality forever. Soon after torturing his parents for a few weeks, he had advanced to a level of play worthy to play a venue call the Trolley Stop in the Oregon District. By age 10 Joe and Jack produced an album titled 10+50. Many years and many performances later they are close to the next that will be titled 20+60. Although Joe calls himself a harmonica player “by trade” he is also well versed in percussion and strings. Scott Houchens and Dana Farley performing under the name Reform School Reunion. They sing classic songs from yesterday and today. 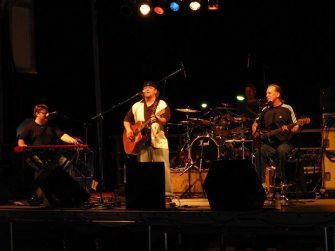 Formed in 1985, The Muleskinner Band’s first performance was at Market Place ‘85 in Urbana, Ohio. 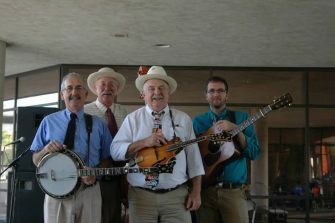 Since then, the band has traveled to 5 different states, including West Virginia, Kentucky, Indiana, Tennessee, Pennsylvania, and extensively throughout Ohio. Strong vocals, slick instrumentation and light-hearted interaction with their audiences make them crowd favorites. They have recorded 6 projects and each of the members has been asked to guest on other recordings. I’m a Singer/Songwriter that was raised in WV playing Bluegrass Music in the church and at Festivals. I was raised by a guitar player named Dave Liles and my mother Terry. Dave played guitar for David Allen Coe, Johnny Paycheck and The American Eagle Band. I started playing at a young age (around 10) and never stopped. I never dreamed of being anything other than a musician. Working hard to be a good guitar player shaped who I am today. I moved from WV to Kansas City MO and start playing out right away. I would play wherever I could because I had a fire in my belly that could only be put out by gigging. Playing in KCMO I learned a lot. 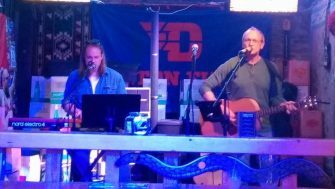 After about 3 years I felt I learned all I could and moved to Lima Ohio where I had connections and would be able to play more as a solo act. I shaped a show from request and songs I had passion for. People seemed to like my show and I started playing 5 to 6 times a week within a year. Taking time to talk to the crowd and learn what they want to hear became a priority and I gained some popularity. This whole time I was writing songs and wanting to play them but I did not have the confidence to only play original songs for a long time. I met John Heaphy a local biz owner and singer who loved my music and asked me if i’d like to make a album and of course I did. We recorded a album of my 1st songs called Sinners & Saints and it turned out really great. We got John Popper of Blues Traveler to guest star on the album and that brought us some attention as well as the songs being really great. I toured all around after we released the album promoting it. I played out about 6 nights a week all over the tri-state area. Even playing a house gig for 7 years every Wednesday night at Cranberry Resort at Indian Lake Ohio. After moving to Columbus Ohio in 2010 my career really took off. I started getting request to play at all kinds of venues and events. I signed a contract with a agent and started playing the Festival circuit. After recording 2 more albums Alive At The Room and SouLow I’ve been playing more original songs in my show as long as it’s called for. 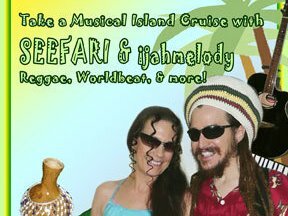 Soothing Steel Drums to Hot Tropical Dance Beats – Seefari brings the flavor of the islands! Whether you want laidback mood music or irresistibly danceable Caribbean Rhythms, Tom “Seefari” Carroll is the Island Music Specialist! This Internationally renowned recording artist has worked with musicians from all over the world – from Jamaica to Hawaii to Africa. Award-winning, chart-topping, critically-acclaimed Recording Artist Seefari specializes in Festivals, Concerts, Universities, Corporate and Private Events, Private Clubs, Multicultural Events, Charitable Functions, Clubs and Casinos. Singer and Multi-instrumentalist, Seefari’s diverse musical repertoire bridges the generation gap and appeals to everyone. You’ll hear authentic island sounds as well as American classics with an island beat. Seefari’s musical expertise and professionalism will assure you of the highest quality of excellence in the musical portion of your event. The universal appeal of Island music will leave all those in attendance with the feeling of having vacationed in the islands! Seefari can perform as a solo, duo or with his world-class band. His duo partner, Singer/percussionist ijahmelody adds angelic high harmonies to Seefari’s soulful singing for a sweet vocal blend. She is skilled on a wide array of percussion instruments and her vibrant stage presence lights up the stage! Seefari Duo – “The Duo with a Full-Band Sound” is a popular choice for private parties, corporate events, colleges and festivals. Seefari has headlined countless large outdoor festivals across the USA. His band features top-rated musicians from all over the world. Add the flavor of the Islands to your next event! Soothing Steel Drums to Hot Tropical Dance Beats – Caribbean Jazz, Soca, Reggae, Calypso, Salsa, World Beat and more! 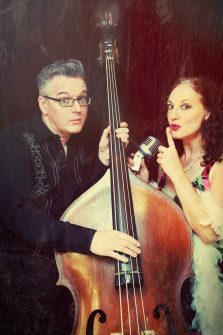 Anna & the Consequences perform 1940’s jazzy torch blues with lots of sassy lyrics and sultry grooves. Anna Paolucci and her Ohio based combo might sound familiar but definitely shine a light on the innuendo driven music of days past, feather boa and all! Duo to 10+ pieces with horns and available for intimate private events or large corporate shindigs. Great voices, old stand up bass and really good tunes. Anna tailors the ensemble and its song list to entertainment any engagement. You’ll remember Anna & the Consequences. Bob Lucas is a glory shouting, sweet singing, banjo picking, guitar thumping, old time fiddling, song writing rounder with a desire to share a sense of musical wonder anyway he can. Coming up during the great folk scare of the 60’s he was fortunate to be taken under wing by some of the great traditional musicians and singers. It is the wonder of that era that still holds keen with him. Having grown up in a family of singers and musicians it is only natural that Bob would continue to play music with his family. With Chloe Manor his daughter and her husband Chris Westhoff they make up the Hedgehog String Band. This ensemble makes music with power, thrust and charm that is just down right good and dancy. These three do not draw the line at old time traditional music. As has been so often the case, tradition is a springboard that gives the lift and velocity to dive into the ever-welcoming pool of twenty first century contemporary music. Off they go without a splash. 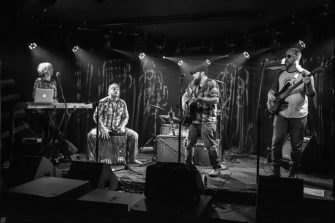 The Devil Doves have released their 2nd album Also Playing and are actively touring throughout Ohio; surprising and delighting audiences at taverns and festivals with their energetic live performances and creative songwriting. The new batch of songs picks up where their well acclaimed self-titled debut record leaves off, focusing on the gruff, reflective lyrics of Junior Kauffman and the groove laid down by Kyle “Headband” Davis on the cajon and Rev. Rico “Thunderstorm” Nassau on the bass. The addition of Jeff Straw’s keyboard on Also Playing completes the sound; filling the spaces in-between the beats with catchy organ riffs and improvised piano prowess. The 11-song sophomore effort highlights a tight sound with angelic harmonies over a rough and tumble skeleton. 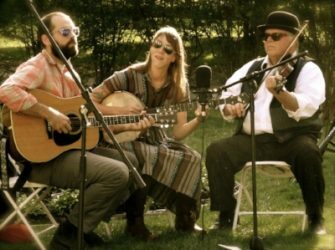 Great food and live music on the outdoor stage (6-8pm) with the Hedgehog String Band on Friday, and Devil Doves on Saturday night. From 4-7pm, haywagon farm tours, u-pick pumpkin patch, kids costume contest, pirate treasure dig, and Sunset Terrace dining and seasonal drinks for all ages. Hulu hooping dancers with demonstrations and participation will be in the stage area also. From 7-10pm, A kid-friendly spooky adventure after dark on a Pirate Ship Voyage to search the haunted “Tortoise Island” with UV flashlights and to “Signal Fire Hill” for a bonfire with s’mores and story telling. A Gypsy fortune teller and fire artists will be at the main stage area. Adult costume contests and music stage light show, with a celebrity appearance by the “Night Walker” and other selfie opportunities. A full bar menu with fish, shrimp and chicken entrees, capped off with old-fashioned home-made Pumpkin Pies and real whipped cream!